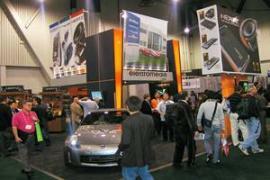 The latest success of Elettromedia: CES 2007. Elettromedia took part in the Consumer Electronics Show and achieved an astonishing performance, with such a significant commitment as has never happened before for a show in the United States. Since 1991 the Elettromedia products have been constantly present at the CES in Las Vegas, but this year the company prepared an unprecedented show. Elettromedia has unquestionably become a leader within the Olympus of the world’s big consumer electronics companies. And numbers, being not less than our American or Japanese competitor’s, confirm this achievement: an exhibit area of more than 120 sqmt and an upper level specifically reserved to commercial meetings; a staff made up of more than 30 people, out of which more than half from the Italian head office. The Consumer Electronics Show of Las Vegas, at its fortieth edition, is the world’s most important event for all the consumer electronics professionals: this year the show attracted 2,700 exhibitors and more than 114,000 visitors. A large crowd visited the Elettromedia booth, especially enjoying the brand new Audison ABD Class amplifiers. Nobody passed by without stopping in front of the Hertz product display: the new Hertz HP amplifier line, among which the HP 1KD was awarded with the prestigious 2007 Innovations Award, and the SPL Monster subwoofers simply amazed the crowd. Inside the booth area a demo car was shown, built according to ambitious concept: to ensure a true “audiophile” performance without the need for major modification of the vehicle inside. The result was an amazing Nissan 350Z in which an Hertz MLK2 kit, an Hertz ML 2500 subwoofer and an Audison LRx 5.1k amplifier were installed. During the show Elettromedia had meetings with many customers, partners and distributors from all over the world. The meeting area arranged on the upper level of the booth was constantly busy, with a feverish front desk activity both with distributors and dealers. The Elettromedia management took the occasion to thank all of its foreign co-operators and to give the “Elettromedia Dealer of The Year Award” to East Hamilton Radio based in Ontario, Canada. The success achieved at the Consumer Electronics Show confirms the positive trend of our company, which closed 2006 with an historic turnover record, marking a +9% growth comparing to the previous year. The next show will be My Special Car Show in Rimini, where Elettromedia will meet the warmest crowd, the Italian one. Join Audison team at CarMediaWorld during Automesse Salzburg 22-24 March, to discover new products and to listen 🎵our amazing demo car 🏁. We are waiting for you in hall 10, booth E38.🤙 You can't miss it! Bit Play HD Apple App now available from the App Store. Check out the brand new Audison 2014.1 general catalogue! Audison bit Play HD wins EISA Award. Audison AP8.9 bit wins EISA Award. bit Play HD: High Resolution Mobile Media Player. Elettromedia at 2011 My Special Car Show: sheer fun! © elettromedia 2019 . All rights reserved. The personal data you voluntarily provided will be handled using IT and telematic procedures. ELETTROMEDIA SRL undertakes to make appropriate use of the information in compliance with existing regulations and with the utmost attention and respect for personal data. With regard to this, pursuant to Articles 13 and 14 of the European Regulation No. 679/2016 (GDPR), the Company informs you of what is described below. Processing your request to receive material and technical and commercial information. Sending some commercial and marketing-related information regarding events and new products. Where the information provided to ELETTROMEDIA SRL includes sensitive data (namely data revealing racial or ethnic origins, membership in parties, trade unions religious or philosophical beliefs, religious, philosophical-related associations as well as data which could reveal one’s health status or sexual orientation) it can exclusively be processed with the prior written consent of the user. In case of communication of sensitive data, the person concerned shall permit the use of it. The handling of the data will be carried out automatically and/or manually through ways ensuring the utmost safety and secrecy by specially appointed internal subjects. The data will be stored for no longer than it is necessary to meet the purposes for which it had previously been gathered and later handled. ELETTROMEDIA SRL will be appointed of the exact recording of all the data so as to make it correspond to what had been stated by the person concerned as well as updating any notification of amendment by the person concerned. Public bodies or private companies for compliance with legal obligations. Although the conferment of data is optional, the refusal to submit your data may make it impossible for your requests to be fulfilled. By compiling and submitting the form, the person concern shall permit consent for the processing of his/her own data in compliance with ways expressed in points a) and b) of heading “Purposes of the processing” of the present data privacy statement. If you so wished, you may exercise your rights in accordance with Articles no. 11 and 12 of GDPR by sending an email to info.privacy@elettromedia.it or by post at the address indicated below. ELETTROMEDIA SRL – S.S Regina km 3,500 – 62018 Potenza Picena (MC) – Tel. 0733 870870 – info@elettromedia.it. Cookies are small text files which are stored on your computer or device, by websites or visited applications. They are widely used to allow the functioning of websites and applications, or to improve their functioning, or to gather information on user behavior on the website and the use of services. “Technical” cookies (performance): these are cookies strictly necessary for the correct operation of a site, used to supply services in a better way and improve your surfing experience. These cookies, even without identifying the user, allow, for example, to detect if the same user returns to connect at different times. Thanks to cookies, the site remembers minimum quantities of information related to your actions and preferences (for instance, login, language and other display settings) so that they don’t have to be re-entered when you visit the site again or you surf from one page to another. Analytic Cookies: they are used to collect and analyze anonymously traffic and use the site. Profiling cookies: : these are persistent cookies used to identify user preferences and send advertising messages based on those. This website does not use this type of cookie. Visiting a website you may receive cookies both from the visited site (“owner”), and from websites maintained by other organizations (“third parties”). An example is the presence of “social plugins” for Facebook, Twitter, Google+ etc. Those parts of the visited page are directly generated by the above mentioned sites and are integrated into the host site page. The presence of these plugins involves the transmission of cookies to and from all sites operated by third parties. The management of the information collected by “third parties” shall be governed by the relevant information to which you are kindly invited to refer. Facebook (configuration): access your account. Privacy Section. This site may also include certain components transmitted by Google Analytics, a web traffic analysis service provided by Google, Inc. Also in this case those are third-party cookies collected and managed anonymously to monitor and improve the performance of the host site (performance cookie). Some cookies (session cookies) remain active only until you close the browser or until the execution of the logout command. Other cookies “survive” the closure of the browser and are also available in future visits. These cookies are known as persistent and their duration is set by the server at the time of their creation. In some cases there is fixed a deadline, in other cases the duration is unlimited. Browsing the pages of this website, you can interact with sites operated by third parties that can create or modify persistent cookies and profiling. _utmz Third-party persistent These cookies are used to collect information about how visitors use the site. This information is used to compile reports and help us improve the site. The cookies collect information in an anonymous fashion, including the number of visitors to the site, where visitors have come and the pages they visited. HOW CAN I CHANGE MY COOKIES SETTINGS? The user can decide whether to accept cookies using the settings on your browser. The setting can be defined specifically for different websites and web applications. Furthermore the best browsers allow you to define different settings for cookies “owners” and those of “third parties”.